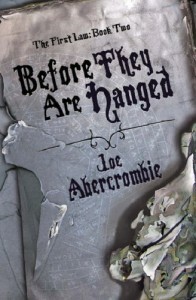 The second book in the First Law series, “Before They Are Hanged”, has all of the good points of “The Blade Itself” but manages to combine this with a much more compelling plot. Bayaz and Logen set off on a quest into the war-torn ruins of the Old Empire in search of a weapon to use against the Gurkish, dragging an unwilling Jezal and Ferro with them, along with the boastful Longfoot and Bayaz’s sullen apprentice Quai. On their way they will face a variety of different threats and, inevitably, there is plenty of opportunity for character development (aside from the continually shallow Longfoot), especially from Jezal as he finds himself torn from his simple life as a young officer and forced to cross a deadly continent on what he thinks is a fool’s quest. Meanwhile Major West must somehow deal with trying to save or survive the Union’s campaign against Bethod as he finds himself assigned to the staff of the foppish Prince Ladisla, who is given charge of the Union’s reserves in the vain hope that the responsibility might make a better man of him. Inquisitor Glotka is despatched to the threatened enclave of Dagoska to investigate the murder of the previous head of the Inquisition, armed with orders to force the reluctant ruling council into fighting against the seemingly overwhelming might of the approaching Gurkish army. As the book goes on more is revealed about the backstory of the series, particularly Bayaz’s and Khalul’s histories and about the destructive wars and rivalries of their own masters. There are a few interesting twists in the plot, including the amusingly anti-climatic end of Bayaz’s quest, and there are intriguing hints that Bayaz’s intentions may be different to what they initially appear. Some significant changes in one of his companions also seem to be setting up what could well be another plot twist in the final book, although it is difficult to tell exactly what that might be. Glotka continues to be the best character in the book, and his desperate struggle to try to make Dagoska hold out against the seemingly overwhelming force ranged against it is one of the best bits of the book. The characterisation and dialogue continue to be entertaining and well-written. The plot is faster-moving than in the first book and there are more big action scenes, principally the two battles between the Union and Bethod’s army and the siege of Dagoska. Some things are resolved, but the ending of the book isn’t as decisive as might be expected, considering there is only one book left in the series but a lot of plot threads left to be resolved. In summary, this is a very entertaining book and as the series goes on the plot is becoming increasingly complex and interesting.